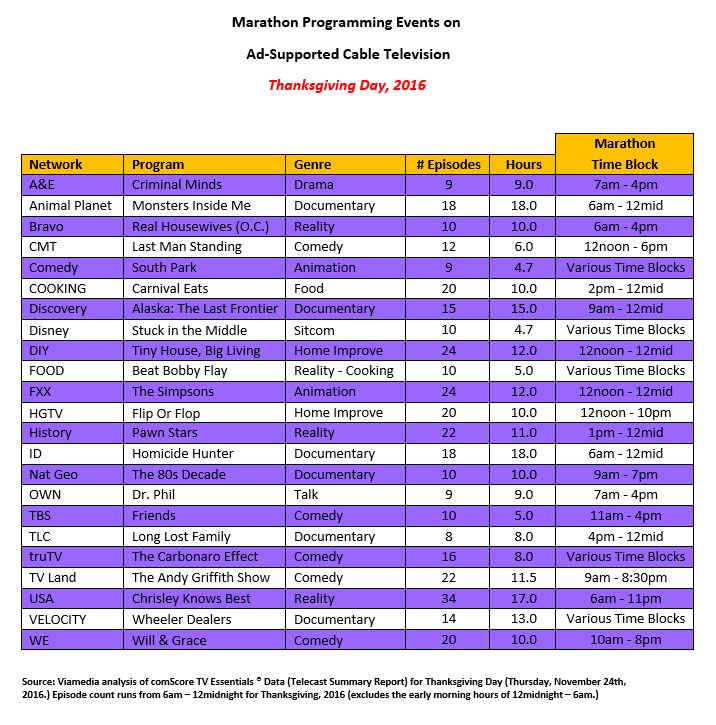 In what has become an annual holiday tradition, the cable industry will be serving up a stack of marathon programming events this Thanksgiving Day, Thursday, November 23rd. And side-by-side with all that great home cookin’ will be a round-the-clock buffet of ad-supported cable programming. Airing consecutive episodes from the same program has led to what we call today, “binge viewing” -- a term we normally associate with several over-the-top digital channels such as Hulu, Netflix and Amazon. But long before the Internet became a standard household utility, the cable industry was running marathon programming blocs, starting in the early 1990s with TBS’ “Seven Days of 007”. That quickly morphed into “15 Days of 007” and soon thereafter cable networks began experimenting with their own marathon programming events. 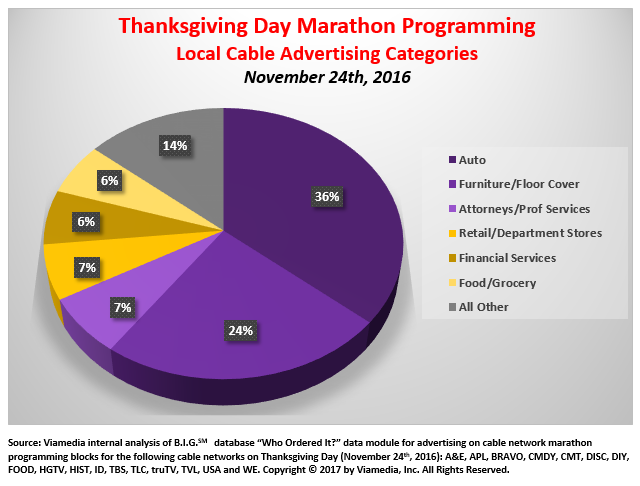 We isolated the day of Thanksgiving, 2016 (November 24th) and found 17 of the above “marathon networks” that exhibited local cable advertising activity during a marathon telecast. In total, 137 clients ordered over 1,000 30-second spots across 47 Viamedia markets (60+% of Viamedia’s nationwide footprint). 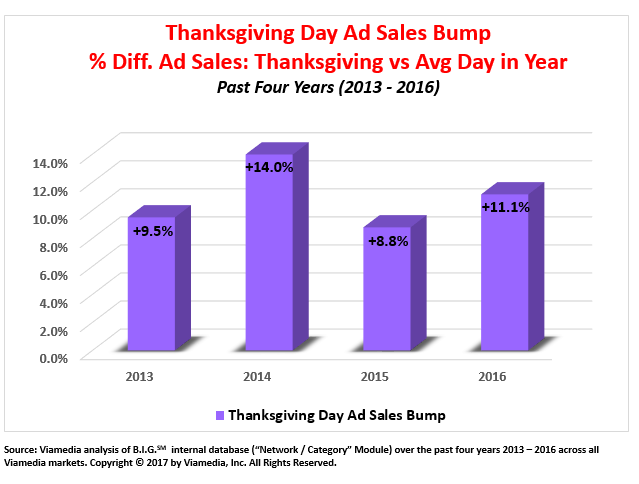 That comes to an average of 8 spots per advertiser. Source: Viamedia internal analysis of B.I.G.SM database “Who Ordered It?” data module. Copyright © 2017 by Viamedia, Inc. All Rights Reserved. When it comes to Thanksgiving Day dinner, so many culinary traditions have arisen over the years. Little did I know that the traditional oven-roasted turkey served in my home is actually optional in others, where you’re just as likely to find all sorts of comestibles, from deep-fried turkey, to ham, roast beef, pasta, pizza… you name it. And, of course, there will be one other dish served up in extra large portions – a savory selection of marathon programming on ad-supported cable TV.